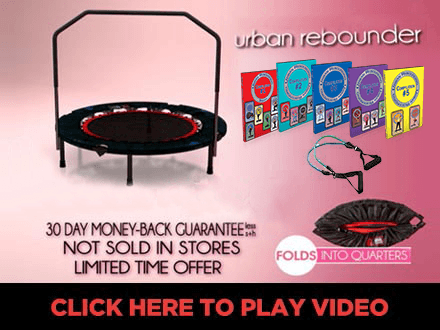 Home | Urban Rebounding: The Urban Rebounder is a fun dynamic workout! #1 Cardio Workout in the Country That's Easy on Your Joints! 5 Mega DVDs with 20 gym quality workouts: First timers, basic, intermediate, advanced, senior, abdominal, pilates, african, kick, hi-lo, resistance, interval, sports-specific, stretch, dance, ballet and box and bounce, yoga, latin and hip hop down. This Gym Urban Rebounder is the official Rebounder used in over 5,000 gyms worldwide. Consumer Reports Top 100 Products of the Year! Want to learn more? Check out our Urban Rebounder Videos here! 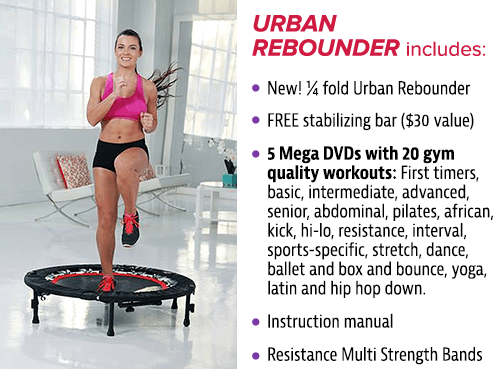 Offer Details: Receive the NEW quarter folding Urban Rebounder, the stability bar and our 3 DVD workout programs for $99.99 with FREE shipping. Applicable Sales Tax will be applied to orders being shipped to California, New York and South Carolina. Free Shipping within the Continental USA. Orders to Canada will incur a $49.95 shipping charge per unit.